DO YOU HAVE GOLD STAR MEMORIES? Did you record at Gold Star Recording studios? Did you stop by and witness a session? For more information on this subject go to the History page. 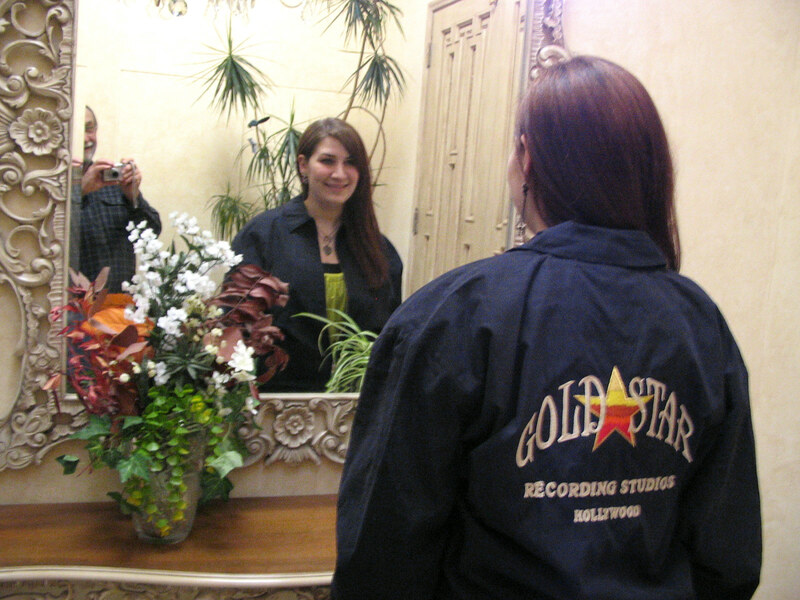 BY OVERWHELMING DEMAND THE NEW GOLD STAR JACKET IS NOW AVAILABLE ! The new jacket is available in black only. The outer shell is a nylon/polyester soft blend sanded microfiber. The lining is nylon, adjustable snap cuffs and inside zippered pocket. The heavy custom embroidery will be as on the original pictured above. They certainly were worth waiting for. Your personalized name will be on the upper left front. At present sizes M, L, XL are available, however XXL and Small can be ordered, but will take up to 30 extra days for delivery. Home Recording sat down with noted engineers Stan Ross, Dave Gold, and The late Larry Levine of L.A.’s famed Gold Star Recording Studios, For An in depth interview. It was just another day of greatness at Gold Star Recording Studios on Santa Monica Boulevard in Hollywood. "Kid, you’re going out there a nobody, but you’re coming back a star," is the classic show business cliché, and for 33 1/3 years, Hollywood’s Gold Star Recording Studios founded by David S. Gold and Stan Ross breathed life into that phrase for hundreds of major artists. The Runaways’ Joan Jett and Cheri Currie, Meat Loaf, The Champs, The Baha Marimba Band...even Alvin & The Chipmunks among dozens of others, all had their first introduction to the art of recording at the trailblazing studio that changed the course of modern music. Located in the heart of Hollywood, Gold Star Studios’ efforts encompassed the entire entertainment industry and threw open the doors of unbridled creativity to music, film, television, radio and Broadway artists and impresarios such as Frank Loesser, Johnny Mercer, Sammy Fain, Dimitri Tiomkin; legendary West Coast Jazz artists such as Gerry Mulligan, Chet Baker, Oscar Moore, The Hi-Los and the classic swing bands such as Louis Bellson’s. As the recording ‘home’ of ABC-TV’s first prime-time Rock & Roll Show ‘Shindig’; Gold Star Studios hosted virtually every major pop artist of the 1960s. And for established artists like Bobby Darin, The Who, The Monkees, The Band, The Go Go’s, The Ramones, The Association, Art Garfunkel, Leonard Cohen, Bob Dylan, John Lennon, Tommy Boyce and others; Gold Star Studios provided safe creative harbor, an opportunity to revitalize flagging careers, explore new sonic territories free of ‘bean-counter’ constraints or to pay homage to Gold Star’s rich heritage still reverberating in the walls of Gold Star’s ‘perfect’ echo chambers - the walls in "The Wall of Sound". And most importantly: Gold Star between 1950 and 1984 generated more National Endowment of the Arts (NEA) and Recording Industry Association of America (RIAA) "Songs of the Century" and Grammy Hall of Fame winners than any other independent studio in America. Combining David S. Gold’s custom-designed and hand-crafted technology with Stan Ross’ relentless creativity and groundbreaking approach to recording as an art form, Gold Star Studios pioneered or gave the first popular exposure to recording techniques and effects that define modern music: from the first platinum album to such now - commonplace audio effects and techniques as phasing, flanging, automatic double-tracking and others. Before they were two of modern music’s most esteemed geniuses, Dave Gold and Stan Ross were two plucky, street-smart kids who overcome almost insurmountable odds to build their dream studio - gleefully hoodwinking Hollywood’s tight-knit songwriting community in the process. Unencumbered by major record label restrictions, Gold Star’s freewheeling "recording-is-art’ approach ultimately changed the course of modern music and modern recording studio design while wrestling America’s recording capital crown from New York, Nashville and Memphis. Featured in hundreds of books, hit films, documentaries, accredited college courses and magazine articles; Gold Star Studios pioneered the single most important innovation in 20th Century music: what Sir George Martin called "the recording - studio - as - instrument" concept. In the 1950s, recording equipment and console technology was primarily designed for radio or television uses and available through professional audio contractors. Today, entry level, semi-pro and professional recording technology and software is as far away as your nearest music store and is as essential a tool for songwriters, composers and musicians as pens and paper. Today, entry-level musical instrument, amplification and effects technologies routinely incorporate the sounds and effects that shocked listeners and revolutionized the entertainment industry decades ago when they first appeared on Gold Star recordings. Today, recordings from "Summertime Blues" though "Pet Sounds" through "End of the Century" still resonate today with listeners of all ages because two brilliant, upstart Los Angeles kids in 1950 envisioned the future of music - and made it happen at Gold Star Studios. Welcome to the website that celebrates the epicenter of modern music: Hollywood’s Gold Star Recording Studios - where hundreds of hungry young artists and esteemed ‘elder statesmen’ all captured their Days of Greatness! * Stan once produced a hit record by utilizing the controls to ‘follow’ a bandleader who was teaching a melody to the various assembled musicians prior to the actual session. * After he attained stardom, Neil Young insisted on David Gold personally mastering all of Neil’s solo albums to ensure the highest quality sound reproduction. * When The Champs were unable to complete the B-side to a recording, Stan improvised a new arrangement on the spot and gave them their one and only hit: “Tequila”.